Cookie Bouquets are a fun and delicious way to send a personalized greeting to family, friends, neighbors and co-workers. I think of them as " edible greeting cards", so when I selected the music for this video, I thought of how greeting cards are sent through the U.S Postal System daily and naturally, " Mr. Postman", became my only choice for this video of dancing cookie bouquets! ( Please note: Availability of cookie bouquet designs does change periodically, so not all cookie bouquets featured in this video may be available at time of order. "Leigh's Fresh & Fabulous Flowers"
I like a variety of music genres, so after the slow,gentle love ballad of " My Forever Valentine", it was time to pick up the tempo with a lively song! Fresh flowers are perfect for every occasion imaginable. from the somber condolence of parted loved ones to the joyful bliss of falling in love! " For Once in My Life" by Stevie Wonder, is a lively song about discovering true love. I added special effects and transitions between color families of the flowers pictured and occasions as well. I had a great deal of fun making this video and I hope that you'll enjoy it! "Set The Mood and Keep It Lite!" " Set The Mood and Keep It Lite" is a play on words! Candles can quickly set and 'change the mood of a room instantly. I separated the candles in the video by scent types to make it easier for the viewer. " Keep It Lite" refers to the candle jars name, Lid Lites, with another candle built into the lid ! I chose the song, " Candle Glow" to set a romantic mood for my video and since it also describes the ambiance of the candles glowing, it was a perfect choice indeed for the song! Valentine's Day is a day to share with our beloved and to give romantic gifts of flowers, chocolates , perfume and adorable stuffed animals, and possibly even an engagement ring! Valentine's Day was the beginning of a lifetime of love for me and my beloved husband, so the title, " My Forever Valentine" is a truly personal one! I selected the song, "I Love How You Love Me", for it's gentle style, simple testimony of love, and made famous by Bobby Vinton, a native of my beloved city of Pittsburgh, PA! "There's A lot To Like At Leigh's "
This video was made to creatively market a special promotional offer in my online store. I even updated a slide with new deadlines, and republished the video again when the promotion was graciously extended through June 30! " That's What I Like About You" was not my first choice of songs for this video, but after I listened to it and tried different special effects, it quickly became the perfect song for this video! It was one of the popular songs of my early college days, and brings back fond memories. While the title, " There's Alot To Like At Leigh's " does not flow as easily as substituting my name in for " you" , it still fits the tempo, has the same meaning, and avoids messy issues !
" Leigh's Is The One ( For Shopping That's Fun! )" is one that I created to launch the changes in my newly improved website for my third anniversary of being in the gift basket business.After the launch of my last two videos,I noticed a large percentage of wireless users among my video stats. I created a mobile friendly Home Page with clickable links to all of my website's pages, so I used all of the photo icons for my video slides and supporting text to give viewers a taste of what my website now looks like. The " Players" applied style is suggestive of cell phone technology and the new ability to view my site from a hand held device! " Still The One" has long been a favorite song of mine and it conveys stability in relationships ( My husband and I just celebrated 26 years of marriage) and I devote most of my advertising energies to social media, which involves building rapport among users. I am happy to be celebrating three years being on the Internet and I plan to be there for years to come! ​ I created this video to be a " twin video" to my boy video! It is very similar in character, but it has a few differences. Since I have a Leigh's " Little Wonders Baby Boy" and Baby Girl album on Google, then I could not settle for just making one version! Enjoy! "Fourteen Fabulous Ways To Send Love"
This video showcases the newest line of designer flowers added to my online store in September. Since they are from Georgia, I call them my " Georgian Beauties". I used the classic song " LOVE" by Nat King Cole because it pairs so well with the title and sending love with flowers. I love this song and decided to make a new video with flowers instead of gift baskets as in my very first video.
" Leigh's Fresh & Fabulous Flowers"
​ Leigh's Classic Country Christmas is my annual Christmas video for 2013. I made it with the intent of being different from my Christmas 2012 video, " Have Yourself A Merry La Bella Christmas" and also to accompany my newest photo gift album on Google, " Leigh's Classic Country Christmas Corner" . I selected instrumental holiday music instead of vocal ( Frank Sinatra) from a famous Pittsburgh native, Joe Negri, who many of you may remember playing the role of " Handy Man" Negri on " Mr. Rogers Neighborhood", also performed and recorded at WQED studios in Pittsburgh. Being a resident of Pittsburgh myself for over 30 years collectively since childhood, I thought that it was very fitting to select music from an native musician that I adored as a child and admire as an adult. Please stop by my Home Page and click on the Christmas Gift Basket to view my new gift album. I think that it's a great mix of classic gifts for the holidays and a touch of country store charm, familiarity. and great customer service that makes you feel special. 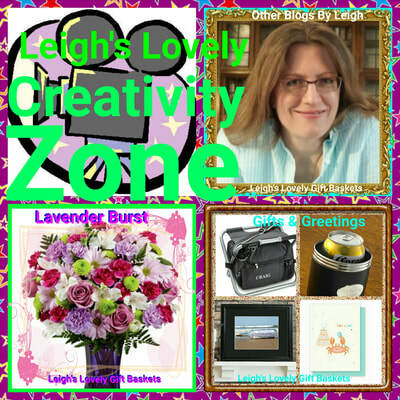 Click here to visit Leigh's Creativity Zone.